MOSCOW ““ In a country where anxieties about anti-Semitism are never far from the surface, Viktor Yanukovich’s victory in Ukraine’s presidential election is being welcomed with caution by Ukrainian Jews. Yanukovich, who has close ties to the Kremlin, replaces Viktor Yushchenko, his West-leaning rival who won five years ago in a second runoff election between the candidates. Widespread protests claiming fraud in favor of Yanukovich in the original runoff spurred the rematch. The pro-democracy protests became known as the Orange Revolution. Yanukovich’s victory, which was finalized last Saturday when his main opponent, Yulia Tymoshenko, dropped her legal challenge to the results, isn’t expected to bring significant changes for the Jews of Ukraine, the head of its Jewish community said. In the west of the country, where ultranationalistic and anti-Semitic attitudes are traditionally stronger, some Jews welcomed the Yanukovich victory. “Unlike Tymoshenko, he is quite predictable,” said the rabbi of the Ivano-Frankovsk community, Moshe Kolesnik. Kolesnik said the community was glad the election was not accompanied by anti-Semitic violence. The election season was not free of anti-Semitic themes, however. Sergey Ratushnyak, the mayor of one western Ukrainian town who was running for president, engaged in smear tactics against another candidate, Front for Change leader Arseniy Yatsenyuk, over his alleged Jewish roots. Ratushnyak, the mayor of Uzhgorod, portrayed Yatsenyuk as a “brazen Jew” serving “the interests of thieves who dominate Ukraine” and using money obtained from criminal activities to capture the presidency. Others also attacked Yatsenyuk as a thieving Jew. Ratushnyak garnered less than 1 percent of the vote, and Yatsenyuk, whose hypothetical Jewishness was never established, won nearly 7 percent. While Yushchenko sought to forge closer ties with the West, especially the United States, his tenure was not without its tensions with Ukraine’s Jews, whose population is estimated at 80,000 to 110,000 in a country of 46 million. A fierce opponent of Russian influence in Ukraine, Yushchenko gave posthumous awards to several Ukrainian nationalists who fought the Soviets during World War II but also collaborated with the Nazis. The latest was the awarding of the Hero of Ukraine to Stepan Bandera, the World War II-era head of the Organization of Ukrainian Nationalists. Hailed by supporters as a fighter for Ukrainian independence against the Soviets during World War II, Bandera is viewed by detractors as a war criminal responsible for the deaths of thousands of Jews. Bandera fought the Nazis, but he also collaborated with the Nazi regime. Following the announcement of Bandera’s award, Ukraine’s chief rabbi, Moshe Reuven Asman, declared that in protest he would give up the state Order of Merit Yushchenko had awarded him. Despite Yushchenko’s predilection for honoring Ukrainian nationalists, he tried to contain the anti-Semitism espoused by many nationalists. Yushchenko’s government shut down 26 branches of the Interregional Academy of Personnel Management, which in 2008 was named “one of the most persistent anti-Semitic institutions in Eastern Europe” by the U.S. State Department. The academy was responsible for about 80 percent of the anti-Semitic publications in Ukraine, according to the Vaad. 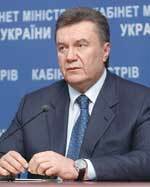 Ukrainians living in Israel helped propel Yanukovich to the presidency, giving him 72 percent of their vote.